In recognition of Men’s Health Awareness Month http://www.menshealthmonth.org/ we are pleased to highlight the story of Sachir “Rocky” from Amman, Jordan. Sachir began his recovery journey in Jordan where he discovered that he was addicted to certain foods. Rocky weighed almost 400 pounds following seemingly endless attempts to lose weight through dieting. To support his ongoing healing process, he came to Florida where he participated in ACORN Primary Intensives. Rocky has lost 190 lbs and, more importantly, is free from the obsession through a deepening understanding of food addiction and the process of the Twelve Steps. Here is his inspiring story. It was one of those perfect days in late spring. The sun was beaming in a bright blue sky and a cool breeze grazed us with a light touch from time to time, ensuring that it would not get too hot. All you heard was the gentle whispering of the leaves, the happy chirping of the birds and the sound of joy and laughter from our kids who were having the time of their lives in and around the pool. I was in my element: Two grills were fired up in front of me and my friends and family were in eager anticipation of what culinary delight I had in store for them today. I loved preparing food for everybody and being creative and working hard to put together an incredible spread made my day complete. All the dishes I had prepared worked out wonderfully, each spice was just right, each combination opened new horizons and when I served food plentifully and beautifully prepared my guests were not surprised but nonetheless in utter awe. We all sat down and enjoyed our meal accompanied by great conversation and lots of laughter. At this time, I was in my 40s, a happy husband, a proud father and a successful professional. Life was good. But under the surface, it wasn’t good at all. I weighed 370 lbs., took 8 pills a day, had developed bulimia and a dependency on laxatives and compulsive exercising. Nobody suspected the torment that was hiding behind my smiling face, but my 32-year long war with food and weight had exhausted me, frustrated me and worn me down. I had learned to pretend that all this was just fine with me and that I am content with myself, but deep inside it was a different story. After all my battles, I tried to surrender to find some peace of mind. I tried to convince myself that there is no solution other than to accept my weight and my obsession with food and to live with the physical and emotional anguish and confusion that comes with that. There was still the ubiquitous pain nagging inside of me to try again, to change, but it had become quieter because I had trained myself for years to ignore it. I was in complete denial and had reached the desperate point of rationalizing that it is perfectly okay to die 10 or more years before my time. I was convinced that I had tried it all and that there was no hope for me, and my life-story spoke for itself. I didn’t know yet that I was powerless. Looking back, I believe I was a food addict since my early teenage years, maybe even earlier. At first I was just enjoying food, like everybody else, but after a while the pleasure and the cravings became more extreme and more compulsive. However, since I was athletic and active I was able to maintain a healthy weight and did not realize that there was a problem until senior year. The last year of high school in my country is extremely demanding and exceptionally stressful. Usually, seniors literally do not do anything but go to school in the morning and study the rest of the day and better part of the night. Life stops and all that remains are stress, fear and the pressure to do well because your whole life depends on those grades. Culturally, food is synonymous with love, care and affection and, like any other of my friends’ mothers, mine also lavished me with treats and favorite meals in order to alleviate my suffering. I found comfort and relief in food but soon the normal sized portions became insufficient. I needed more to keep the same level of happiness. The results at the end of that year were formidable: excellent grades – but an extra 60 lbs in only eight months. I weighed 231 lbs and my waistline had increased by 6 inches! I realized that there was a problem and my war against the weight officially began. I was athletic, competitive and strong-willed and I was able to lose the weight quickly and successfully. But then the weight came back. So I lost it again, and again and again and again…. The problem was not sticking to the diet and losing the weight. It was keeping it off permanently when not on the diet. I quickly entered a vicious cycle of completing a diet and achieving a desirable weight only to gain it all back, and then some. I often felt like Sisyphus, pushing my huge boulder of fat up the hill, only to watch it roll over me and smother me the minute I thought I was home free. Like with Sisyphus, there is nothing more dreadful than futile and hopeless labor and the more times I tried and failed the less motivated I became to try again. My frustration with myself grew exponentially and so did my depression, which consolidated my dependency on the only potent painkiller I knew: Food. 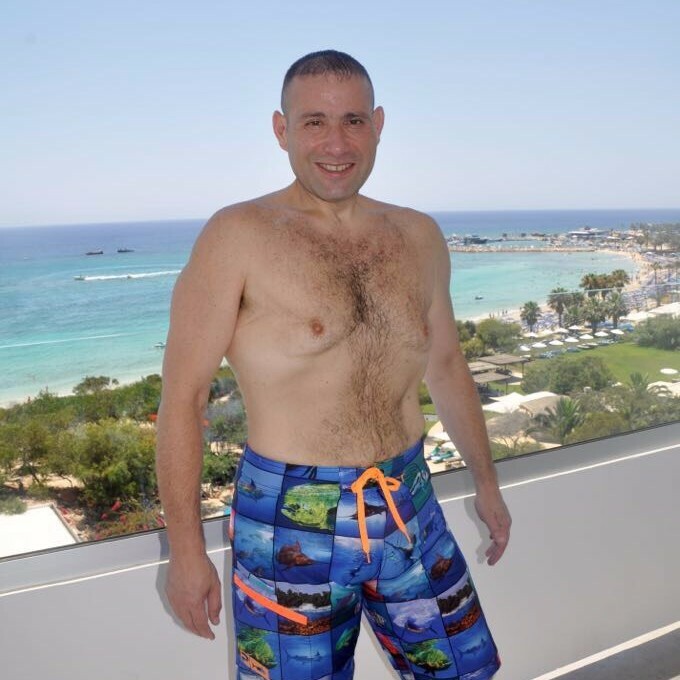 For over 30 years I have lost and gained over 1000 lbs. I relentlessly tried everything possible. I have been on hundreds of different diets, took diet pills and supplements, tried acupuncture and voodoo and spend countless hours in the gym. The more futile my attempts became the more desperate the measures grew. When I had to realize that diets did not seem to be the solution, I had my jaw wired shut in order to make it impossible to consume solid food. The first month was a great success and only taking in liquids resulted in losing 50 lbs. However, the cravings were stronger than the happiness about the enormous weight loss. My raging mental hunger led me to be creative, and I started blending simple vegetables and meat. Yet, that did not satisfy me and after a week I was blending burgers and fried chicken. When blending was not satisfying enough, I learned how to untie the wires on my jaw, eat any food I desired and to then go through great lengths to retie them in a way nobody would notice. I was worried that my father would notice, or the dentist or my friends which would have embarrassed me. But actually, deep inside, I was already ashamed of myself and riddled with self-contempt. Who was I fooling? I was very much aware that these are not the actions of a sane man, yet I was powerless to drive against my cravings. The rollercoaster of losing and gaining weight continued for decades, wearing me down, hollowing me out and taking a toll on my emotional health. 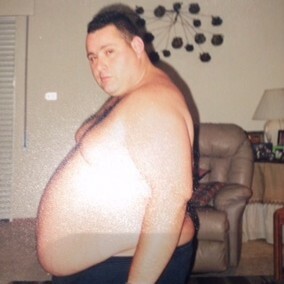 In 1999 I reached new threatening high of 400 lbs. My health was deteriorating rapidly and although strong and athletic, my legs could barely carry me. I suffered from hypertension, gout, high cholesterol and sleep apnea and was on the verge of becoming a diabetic. I was 10 lbs away from dying. Extreme measures had to be taken, and quickly, so I decided to undergo gastric bypass surgery. Considering my weight the surgery was very risky, including complications when administering general anesthesia and risks to the respiratory and cardiovascular system. The pre-surgery talk with the doctors terrified me and, like a small child, I just wanted to run away and hide. A million thoughts were running through my head, tormenting me and making my brain want to explode. I was thinking of my children and how I wanted to see them grow up, my wife, my parents, my whole life that I still wanted to live…. But I was trapped and I knew it. There was no other way: yes, the surgery was dangerous but if I didn’t do it, my weight would most certainly kill me. I had reached a dead end and there was only utter bleakness and desperation. As expected, the surgery was complicated and difficult. I had to have both general anesthesia and an epidural, which has left long lasting side effects. The procedure also took much longer than anticipated. Due to the extended time under sedation, it took me almost two full days to properly wake up and I had to spend two weeks in the CCU. I was happy I was alive but watching my family suffer and worry about my health made me vow to make it work this time. I never wanted to subject any of my loved ones to so much pain again and it was agonizing to be the reason for their tears. I immediately started to lose weight – after all there is not much you can fit into a 1 oz stomach! Within 2 years I had lost over 180 lbs and physically I was feeling much better. My blood pressure had gone down, I could sleep much better and moving around was actually a pleasure rather than a burden again. However, mentally, my relationship to food still hadn’t changed. I still experienced the same anguish and obsession with food and still found it hard to stop eating. The realization made me furious and resentful. It depressed me more than ever that after all I had gone through I was still desperately helpless and powerless vis-a-vis food. However, the anguish continued. I hated myself for being so weak but simultaneously I was searching for ways to satisfy my raging cravings. This time, the solution was simple and very convenient. Since I could not eat big quantities in a single sitting anymore, I resorted to eat constantly. I became a grazer and slowly but steadily began to regain the weight I had lost. Back it was on the battlefield again, trying out diets, losing weight, gaining weight, caught in the sticky web of being obsessed with food, struggling to finally break free and be in control. I grasped that I was powerless in front of food, that I could not stop eating and I loathed myself for that. Yet, I always believed that I could gain control by incarcerating the cravings into strict diet plans and that it was normal to sometimes lose control. Therefore, the cycle of diets and bingeing continued and with every failure I spiraled deeper and deeper into feeling despicable and humiliated. But, by nature, I am a happy person. I love and enjoy life and I suffered from feeling so miserable. This was the point where I gave up. I tried to convince myself that I had tried everything I could, that it was just not in my hand to be thin and that I should just not attempt to lose weight anymore. I wasn’t truly convinced of course and my thoughts would still perpetually revolve around the same two topics: wanting food but craving to control it. The first step to salvation happened at a Christmas dinner. I was full of joy at the prospect of a beautiful evening, enjoying an endless feast of delicacies when two friends walked in and I hardly recognized them. They had lost around 50 lbs and looked amazing. I was mesmerized by how relaxed and content they seemed, how healthy they looked and how happy they were. They eagerly told me about the new program that had changed their lives, encouraging me to participate as well. Yet, I only pretended to listen out of politeness and respect. In my mind I was convinced that nothing could save me. My wife was extremely worried about me. She watched me not only almost killed myself with food but also noticed huge changes in my personality. Rather than being my happy and mellow self, I was constantly irritable and short-tempered. Any family plans were no longer made around what would make the kids happy, but always depended on food being included and to my liking. She had done everything to support me in all my diet endeavors and every failure was as painful for her as it was for me. For the first time in decades she had hope and she was determined to defeat my pessimism and stubbornness and to give me hope as well. Photo: Sachir (Rocky) and his sons. Three months later, I attended the three-day workshop my friends recommended. The lady was talking about her personal life-long struggle with weight and how ACORN finally saved her life. All the participants had to share their stories and every story they told was like watching a movie about my life. And for the first time in my life I learned that there is something like food addiction and compulsive overeating. It was a total revelation and I was deeply intrigued by all I learned. I immediately felt uplifted, hopeful and optimistic; emotions that I had thought had long ceased to exist. Feeling the need to learn as much as I could about the subject, I traveled to Bradenton, Florida, to take my first intensive workshop with Phil and Mary. Realizing and admitting that I am a food addict and understanding that I was powerless filled me with strength and determination to finally walk on the right road to recovery. I was lucky to have 10 other people in my group and sharing our pain and problems with no hesitation enriched this experience. I have been back several times to strengthen my abstinence and to acquire more knowledge from Phil and Mary, who were paramount in making me acknowledge I had a problem and who played a significant role in my recovery. Photo: Mary Foushi, Rocky Ajlouni and Phil Werdell – Aqaba, Jordan. I have been abstinent for 2½ years now and I have never felt better. Not only have I lost 190 lbs, but also my fear, hate and anger. No longer do I go through agonizing cycles of self-loathing, resentment, uncontrollable cravings and overwhelming obsession with food. I have finally found peace of mind, tranquility and an equilibrium and, rather than gaining weight, I am now finally free to gain new experiences and to make new memories.